But sometimes the phone rings after midnight for a good reason. A very good reason. Such was the case this past Tuesday night, when the phone rang and I learned that I had two new nephews. Yes, they were a few weeks early. I guess Marc and Ian just couldn’t wait to meet their uncle and they arrived at just 31 weeks. So … now I have two little nephews: Marc Owen (4 pounds) and Ian Benjamin (3 pounds, 15 ounces), who were born at 2:27 a.m. and 2:28 a.m. on January 26. I’m not going to get to meet them for another few days, and I can hardly wait. Two boys. How cool. How fun. How long do I have to wait till we can play wiffle ball, or till they can crawl all over me and try to pin me to the ground? These guys are gonna be trouble, and it’s gonna be awesome. Oh, and in case you’re wondering about Abby … she’s handling it all just fine. 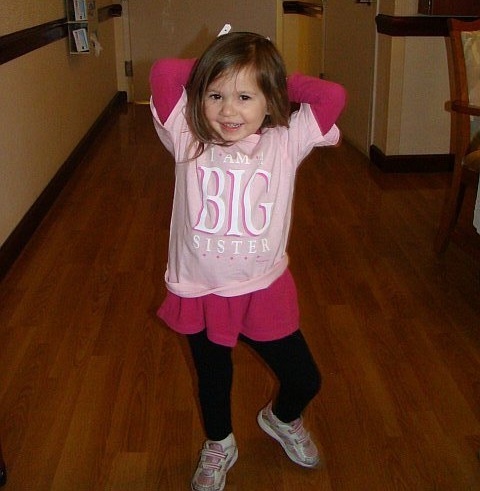 She loves the idea of being a big sister, and loves the tshirts, the hats, and the bracelets that say “Big Sister.” We’ll see how well she handles it when Marc and Ian — or “Mookie” and “Alex,” as she calls them — come home from the hospital in a few weeks. And just for the record, Abby, Marc, and Ian can call me anytime.